Click to enlarge, etc. The thing to know — which explains the front of the card — is that they’re not printed on standard-sized business card stock, but on 150-lb tag, cut to 3″x5″. Index card size. The dotted line is actually a perforation, so a standard-sized business card can be detached from the index card. When I flip the card over, it’s designed to write on the back, either horizontally or vertically. Detaching the standard-sized business card leaves the knight logo aligned in the corner on the back. 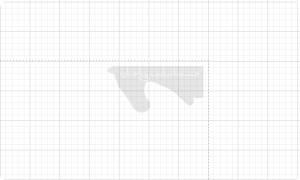 For good measure (and attention to detail), the heavier lines on the grid are exactly ½”. Look closely at the traveling note pad in the hands of the German philosopher and poet Goethe. He is using an early version of what we carry on today as our Pocket Briefcases. Often it’s when we’re traveling that inspiration strikes (even if it’s just taking a walk, as Thoreau so well demonstrated). A portable, pocket-size leather writing pad and a supply of 3 x 5 cards can become your indispensable tools for on-the-go thinking. And of course, thinking is what I do… and of course, ideas come at any time. 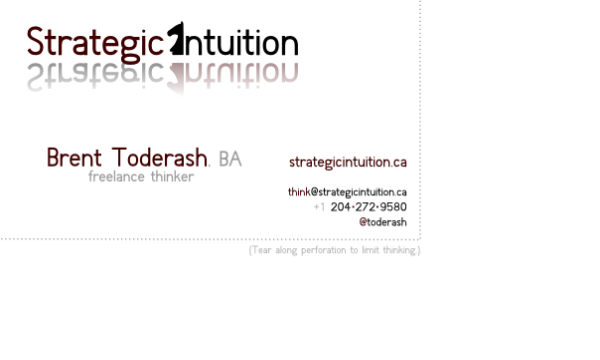 I already had a habit of using 3×5 index cards, so this new format of business card is perfect for me. Bundled up, it’s practical, stylish, memorable, and personal. I think they’ll stand out. 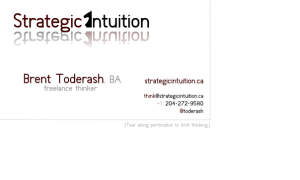 This entry was posted in Brent Toderash, Marketing and tagged 3x5, business-cards, design, Goethe, Ideas, Levenger, note-taking, organizer, pda, printing, thinkers by Brent Toderash. Bookmark the permalink.